Have you ever heard any health and fitness professional say that they offer physical therapy, physiotherapy or PT exercises? It’s common to hear non-physical therapists like chiropractors, personal trainers, and even athletic trainers say that they offer and can provide “PT exercises”. The truth of the matter is, there are no such thing as “PT exercises”. The only exception is when a patient who is seeing a physical therapist says they have completed their “PT exercises”. I allow this exception because I understand the patient means they have completed the exercises their physical therapist provided. To me, it’s kind of irritating to hear other professionals say they offer “PT exercises”, and it’s not because I don’t want other professionals to offer exercise as part of their interventions to help a patient. Exercise is a great tool, and if a patient can get better through exercise I’m all for it, no matter who is working with the patient. It’s frustrating to me because I find it misleading to my profession, and more importantly it’s misleading to a patient. Exercises are exercises, no matter who is performing them, who is teaching them, and who created them. What make an exercise a successful intervention is identifying the right exercise, for the right person, to address the right problem. Anyone can look online and find an exercise to strengthen their glutes. Then they can watch a YouTube video on how to perform that exercise, and perform it at home. The role of a physical therapist is to identify what muscles actually need to be targeted, and to make adjustments within a particular exercise to accomplish a specific goal. Take an exercise like a hip bridge for example. It’s a great exercise for your glutes. One person may just need to work on strength and endurance while another may have adequate strength, but they have a capsular restriction and are unable to recruit the muscles properly. This same hip bridge exercise would look completely different for the two different people, even though it’s essentially the same exercise. Physical therapists bias joints, muscles and the central nervous system with certain cues and tactics to target deficits identified during a physical therapy evaluation. So you see it’s not the exercise that is necessarily important, it’s the practitioner’s knowledge and skill set that make an exercise beneficial. So why do other Professionals Claim to Offer PT Exercises? Physical therapists are movement experts. This is why a lot of physical therapists rely on exercises as part of a rehab program. As professionals who study anatomy, physiology, biomechanics, and pathology with the distinct purpose of helping people move better, it’s widely understood if someone has a movement dysfunction, the professional you need to see is a physical therapist. As more and more people are realizing the skills and benefits of seeing a physical therapist, other professions want to capitalize on this by claiming to provide “PT exercises”. While most of these professionals may be very good at exercise selection for a patient or client, they still do not have a physical therapists training. When a physical therapists selects a particular exercise, there is research, evidence and a clinical decision making process behind the finished product. 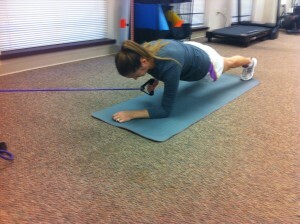 That process is the difference on why certain exercises work for a particular patient, while others do not. Physical therapists look at and understand human movement differently from other professionals in health and fitness industries, which is why exercises provided by a physical therapist are typically so beneficial. This is not meant to take anything away from other professionals. Strength and conditioning coaches have their role in performance and understand training the body for a specific movement or sport and how to periodize a program appropriately better than most in the fitness industry. Personal trainers are great at motivating a client, helping a client improve their health, fitness and wellness and are an asset to a person’s overall health. Chiropractors have a great understanding of the spine and central nervous system as well as other joints. A team approach to a person’s overall health and wellness are the best way to achieve goals and keep people living long, healthy, and active lives. I think it becomes a problem when professionals step outside the lines of their given skill set by trying to be the only provider a person needs to see. I sometimes even see this with physicians who diagnose a patient with a musculoskeletal problem, provide an anti-inflammatory and hand the patient a sheet with some generic exercises to help the problem. While that exercise sheet may work, it likely will not, and the patient will probably stop doing them after a short period of time since they are not seeing any changes. A quick referral to a physical therapist would have allowed the patient to receive and be taught the correct exercises to address the pain, as well as the underlying problem that likely caused the problem in the beginning. This extra hour in the healthcare system could make all the difference in the patient getting better, or opting to have surgery because their “PT exercises” didn’t solve the problem (even though they actually never saw a physical therapist). If professionals relied on each other by sharing knowledge, referring appropriately, and worked together instead of competing for market share, the ultimate winner would be the patient and the healthcare system. So now you know why I don’t think there are any “PT exercises”. It’s the physical therapist who provides years of training, knowledge and skill that makes an exercise a “PT exercise”. Without the input of a physical therapist, a “PT exercise” is just an exercise. This doesn’t mean that exercises are only good if a PT prescribes them. Lots of professional are more than capable of selecting and implementing an exercise as part of a training or rehab program. When patients aren’t seeing the changes or gains they are looking for, that’s when they may need the expertise of a physical therapist. So if physical therapists don’t go around saying they use “PT exercises” to help patients (we just say exercises, or maybe therapeutic exercises) then why are others claiming to offer “PT exercises”? Let’s all agree that an exercise is an exercise, and it’s the knowledge and skill of the professional that makes it beneficial, not calling it a “PT exercise”.